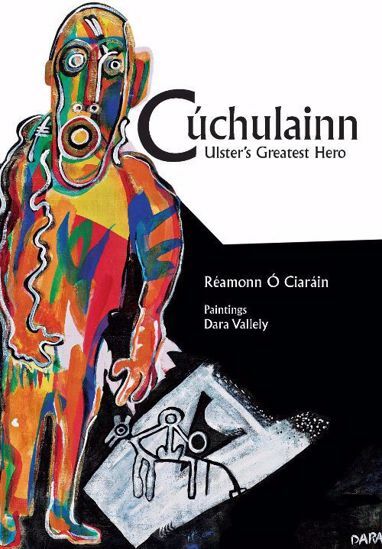 Cúchulainn: Ulster’s Greatest Hero tells the full story of Cúchulainn’s life and exploits. It is written by Réamonn Ó Ciaráin and illustarted beautifully with artwork by Dara Vallely. The stories in this handsome book are all from the ancient Ulster Cycle and they tell the story of Cúchulainn from conception to death. This faithful retelling is made up of the scene-setting stories of the Cattle Raid of Cooley known as ‘réamhscéalta’ and the greatest Irish mythological epic of them all, Táin Bó Cuailgne (The Cattle Raid of Cooley). 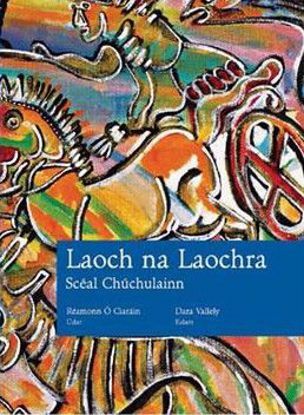 The writing is powerful and easily read and based on the modern Ulster Irish language version Laoch na Laochra, also published by Gael Linn. These ancient stories were first written down in the 7th century by learned and creative Irish monks who had intimate knowledge of the region they described. Like those monks, the author, Réamonn Ó Ciaráin and the artist, Dara Vallely have a special affinity with the ancient territory of Ulster, they both being native to the area. Cúchulainn is a potent symbol of bravery, loyalty, martial prowess, beauty and wisdom. The spirit of Cúchulainn has inspired revolutionaries, artists, sports men and women and leaders for at least a millennium.